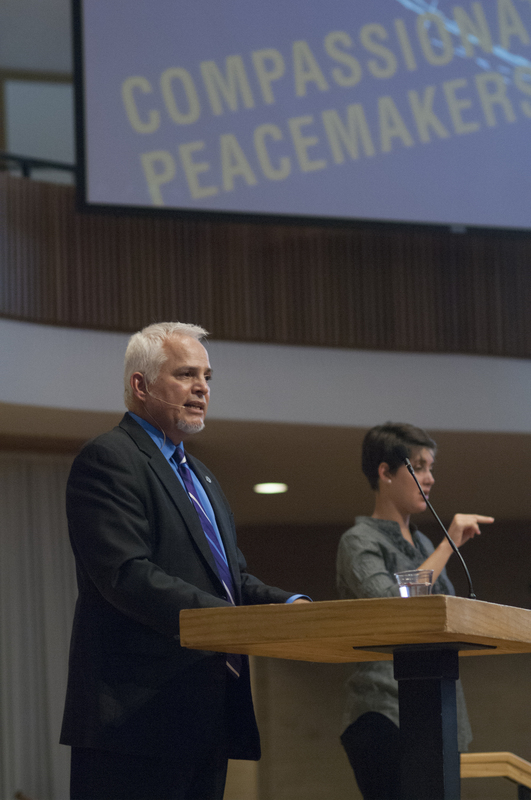 It makes perfect sense to name “peacemaking” as one of the core values of Goshen College, since this college is part of a 500-year-old peace church heritage. It also makes a lot of sense, because few people on the planet would not argue that peace, lasting peace, is one of our ultimate dreams for the whole world. Every Miss America and Miss Universe beauty queen wishes for world peace for heavens’ sake. And, of course, most of all, such a core value makes perfect sense for a college that already named being “Christ-centered” as its chief core value. The Apostle Paul calls Jesus “our peace” (Eph. 2:14) and says, “he came preaching peace” (Eph. 2:17) and Jesus did just that. “Blessed are the peacemakers,” Jesus says in his most famous speech on the mount, “for they shall be called children of God” (Matt. 5:9). As a college whose peacemaking roots run deep, very deep, whose peacemaking identity and ideology are as thick as the trunk of a Sequoia, whose theories and theologies of peace are expansive, whose practices and pedagogies of peacemaking are unassailable, naming one of our core values “peacemaking,” seems like a no brainer to me. What most intrigues me about the naming of this core value is the modifying adjective, “compassionate”: Compassionate Peacemaking. Adding the qualifier “compassionate” to “peacemaking” seems to me to hold within it both a critique and a blessing of the word “peacemaking” that might otherwise have become all too familiar to us here at GC. As to the blessedness of being compassionate peacemakers – a whole series of recent scientific studies have shown that compassion is an instinct that has been honed and blessed by nature in nature – a prophetic critique of Darwin’s one sided violent aphorism: “nature, red in tooth and claw.” These studies all draw similar conclusions arguing that to the degree we experience nature “in the wild” – as thick woods and trickling brooks, desert climbs and ocean breezes, wild flowers and snowy summits – the more self-control, increased working memory, lower levels of stress, and better moods we will have. And, to top it off, a couple of studies show that the more we connect with the natural world, the more compassionate we become. Creation, it seems, has conditioned us with immense capacity to be compassionate. Albert Einstein, himself, noted “the ever widening circle of compassion” found in “the whole of nature and its beauty” for those with eyes to see and ears to hear. By adding the word compassionate to peacemaking, the framers of our core values not only recognized that peacemaking was part of the blood and bone of our college and its 500-year-old peace-heritage, but they also seemed aware of the fact that making peace can sometimes be a cruel and unusual affair. Perhaps, they experienced or knew that it is possible to ‘kill’ others softly with our songs of peace, our words of peace, our attitudes of peace, our peaceful purities and pieties. Every person who calls himself or herself a peacemaker, and aspires to be a compassionate peacemaker, would do well to read the Canadian Mennonite pacifist writer Rudy Wiebe’s award winning novel, Peace Shall Destroy Many, a title borrowed from the poetry of the prophet Isaiah. Weibe’s story shows how distorted and destructive passionate peacemakers can become when they have lost a sense of compassion for others who may be different from them. For the framers of our core values, it wasn’t simply good enough to reclaim our peacemaking core without modifying it a bit with the word “compassion”! Because in the end, isn’t it the case that for all the religions and peoples of the world, peace is not simply the absence of violence, or clever and profound mediation tactics, or a state mind, but as the Dali Lama has put it so well, “Peace is the very manifestation of human compassion”? Should not compassionate peacemaking, then, echoing Einstein, “extend to the whole of nature and its beauty” as well? 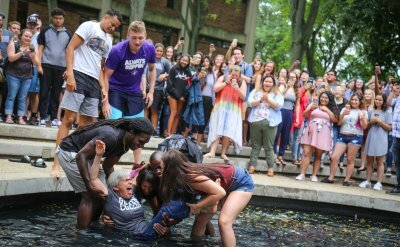 I hope that at a liberal arts college like Goshen College, our understanding of the meaning of the core value “compassionate peacemaking” will be as deep and wide and fully human and wonderfully divine as life itself. And I hope a spirit of compassionate peacemaking generously pervades even our attempts at defining its meaning. For example, how does Al Mackowiak, a 39-year veteran of the Goshen Police Force, now head of Campus Safety and Security here at Goshen College, think about being a compassionate peacemaker? Al shared his understanding of this core value at our recent All-Employee Retreat. He told us he has always measured his life as a police and security officer against the Golden Rule and by doing small acts of human kindness. Al has spent most of his career focused on helping the most vulnerable in our society – 14 years serving as a leader in the field of child and domestic abuse prevention. Al has seen it all. Oh, the stories he might share of caring for the most defenseless among us – stories that might put any one of us on notice about what it truly means to be a person of compassion, a peacemaker, and a police officer. Al served on the board of the Women’s Resource Center and much of the last half of his career he has protected senior citizens from physical abuse, from identity theft and fraudulent schemes to steal their life-savings. I was particularly moved by Al’s quiet and unassuming faith when he shared with us that he wakes up each and every day with a prayer to the Holy Spirit to help him be a kinder, more helpful person to everyone he encounters that day, especially to those most in need. Sometimes then, the rule of law, what the U.N. calls R2P, the responsibility to protect and the right of protection by the weakest among us, is compassionate peacemaking, indeed. Lois Mary Gunden Clemens ’36, who as a young GC grad risked her very life while serving in an orphanage when Nazi Germany occupied France in World War II. She had to make the decision whether she would disobey the law in order to harbor refugee Jewish children hidden among the other refugee children (from the Spanish Civil War across the border), even as Nazi soldiers came to the door repeatedly and unannounced looking for any Jewish children to send to the gas chambers. Anyone who thinks, in hindsight, her decision was clear-cut, need only read her diaries. If she disobeyed and got caught harboring Jewish kids, all the other kids might suffer. Her diaries tell of the horrible mental anguish she suffered, wrestling with what it meant to defy the laws of France and Germany, herself a foreigner, to live in a state of moral ambiguity between the law of conscience, the law of the land, and the duty of protecting a few at risk to the many (innocents), including herself. 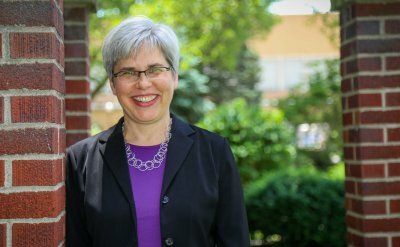 In the end, she was caught, and arrested and held in prison, and but for the grace of God, through a prisoner exchange, she was deported back to the United States where she then returned to teach here at Goshen College as professor of French and German. Just this past year, post-humously, Lois Gunden Clemens, was one of only two Americans ever to receive Israel’s Yad Vashem Holocaust Memorial “Righteous Among the Nations” award for her quiet, but daring act of compassionate peacemaking. Sometimes the higher law of love requires one to disobey lesser laws – this, too, can be an act of compassionate peacemaking. 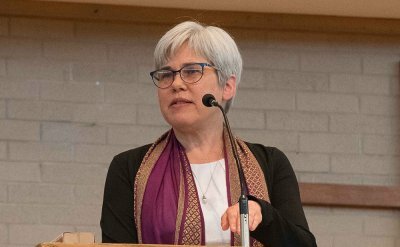 Compassionate peacemakers aren’t always those who’ve spent lifetimes thinking about the theology of peacemaking, or those whose practiced peacemaking skills are fine-tuned, whose compassion is well-honed by years of habit. Sometimes the innocent child or youth can be our best teacher of compassionate peacemaking. In October 2012, the world watched as a Taliban zealot shot a 15-year-old Pakistani Muslim school girl in the head as she and her friends were riding on a bus to school. Her name is Malala Yousafzai. After a year-long recovery, the United Nations declared Friday, July 12 to be Malala Day in honor of this inspirational young girl and in order to commemorate her 16th birthday. She celebrated this day by making her first public appearance and delivering a moving speech to the United Nations Youth Assembly. If you haven’t listened to that speech on You Tube in its entirety, I recommend it. So you see, there is no limit by age or education, but that we, like Malala, can be compassionate peacemakers. For Malala, education for all was the heart and soul of compassion. Jan Zadwadzki, a 2013 graduate and a GC basketball player, was one of the most beloved, funny, friendly, outgoing students here at GC. Last year, in a speech he gave at GC, he coined a phrase, “the Menno Wall,” to describe some barriers he felt sometimes as a student at GC. It could very well be true that had he studied at Baylor, he might have talked about a “Baptist Wall,” if at Notre Dame, a “Catholic Wall,” but here at GC he called it a Menno Wall. So, here in a college whose vision is to become a “world house” of learning, 80 percent of whose faculty has studied, lived and taught on all the inhabitable continents of the world, the majority of whose students study abroad while here, whose bone and blood, whose marrow and nervous systems, pulsate with the language of peace, peace, peace among all peoples, let us renew our commitment to become compassionate peacemakers who tear down walls that still divide us. In a word, then, let us recommit ourselves this year, the year of compassionate peacemaking, to walk a mile or two in each others’ shoes, to sit together in convo and chapel, to eat together in the dining hall, to listen more compassionately to one another, to ask questions of those we do not know, to be more aware of our many privileges and prejudices that keep us apart, to learn from one another about how making peace may even require different ways of doing so between us. In just a few minutes, Parables, GC’s traveling worship group directed by Dr. Deb Brubaker, will come to sing that wonderful spiritual about a river that never runs dry. The song invites us to step into the river, to plunge into its life-giving stream, to let ourselves be lifted by its current – especially so, in times of trouble. It calls to that deep place within each of us where our knowingness flows, where our compassions flow. So let us enter the river of compassion fully – body, soul and spirit. Let us break down walls that would divide us. Let us pursue a compassionate peace that is more relational than legal, more compassionate than particular and more lasting than righteous. Let us find compassion in our peacemaking even when we fundamentally disagree. In whatever form our peacemaking takes, let compassion reign. Let us create at Goshen College a beloved community where, in the words of that great dreamer, Dr. Martin Luther King, Jr., no one is “judged by the color of their skin but only by the content of their character.” Let us sow the seeds of compassion. Let us become compassionate peacemakers, today, tomorrow, and every day for the rest of our lives. Come, Parables, lead us to the River of Compassion!